This is very good reproduction of a book that was originally published in the early 1860's (we really don't know because there is no copyright date. But another book with an October 1862 date in one of the ads in the back mentions this book). 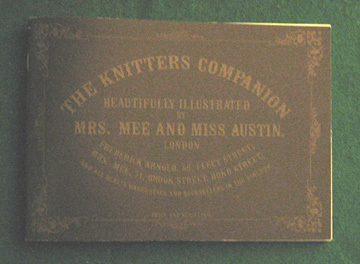 The booklet has twenty-five knitting projects stated in the original period instructions. The projects range from small items, e.g., a baby's shoe, on through larger projects, e.g., an opera cap, on up to larger ones like a Shetland shawl or "warm petticoats for the poor" (this last project doesn't say how much yarn is needed but it suggests it as a way to use up leftovers of wool).